Natalia Olejnik, participated in the Xth Symposium on Nuclear Magnetic Resonance In Chemistry, Physics And Biological Sciences, organized at Institute of Organic Chemistry PAS. She attended in this symposium due to her growing interest in NMR, resulting from spectroscopic part of her PhD project. Natalia has been studying DNP-MAS NMR for half a year in her Partner Institution which is DNP group in the Institute of Nanoscience and Cryogenics at CEA in Genoble, France. Additionally, her French Supervisor attended this event as an invited speaker. This conference provided a full opportunity for practice and constructive dialogue. It was also an ideal platform for sharing the early results of Natalia‘s work as it was an international forum of researchers, education scientists, young scientists and industry representatives who are experts in the field. 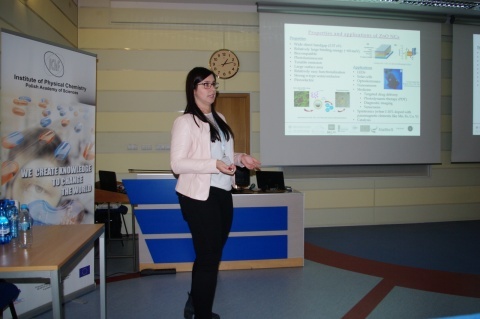 During the conference Natalia Olejnik presented a communication entitled “Dynamic nuclear polarization enhanced solid-state NMR as a powerful tool for probing the surface of nanomaterials with sub-Ångstrom resolution”. Her work was appreciated by organizing committee, that decided to award her with a prize for best Young Scientist Presentation.